Recent data illustrate a rising crisis of wealth inequality. In general, the West is politically apathetic to this challenge, with Scandinavian countries the notable exception. Asia’s strong economic position comes with the opportunity to exhibit global thought leadership in socioeconomic policy, particularly as the region’s inequality grows. Many in Asia have escaped poverty, but capital continues to flow disproportionately to the tiny elite. Systemic favoritism for the rich, along with the worsening plight of the poor, mandates immediate policy attention. A recent Credit-Suisse study reveals some alarming statistics. Seventy-one percent of the world’s population hold wealth valued at less than $10,000, with the next 21 percent having between $10,000 and $100,000. Only 0.7 percent have more than $1,000,000, but these control 45.2 percent of total global wealth. The top 1 percent now own 50.4 percent of global wealth; that is, 1 percent of the world’s population owns more than the remaining 99 percent. Further, despite optimistic talk of a growing middle class, only 14 percent of the world’s population classify as such. Of greater curiosity is inequality in Asia, particularly China – the only country maintaining rapid economic growth well into its development process. For the first time, according to Credit-Suisse, China’s middle class (109 million) outnumbers that of the United States (92 million). By some metrics, progress is evident. The absolute number of Asians living on less than $1.25 per day has decreased from 1.7 billion in 1981 to 700 million today. However, according to ADB Chief Economist Shang-Jin Wei, “$1.25 a day is not enough to maintain minimum welfare in many parts of our region.” Further, Asia’s dynamic economy has produced an elite class of super-rich investors with growing political influence. One commentator describes a rarefied but increasingly common lifestyle: “Asia’s ultra-rich and their offspring, with their private jets and platoons of servants, live in gated communities in a world prized by brands such as Cartier and Louis Vuitton, and educate their children overseas.” Images like this provide little excuse for complacency about the widening wealth gap. Free-market purists are not concerned by such figures and stories of lavish excess; the system is supposedly “fair” and rewards the deserving. In the United States, the ideology of economic Darwinism has even “trickled down” to an aspirational lower and middle class that often supports policies favoring the super-rich, including lower taxes and lax regulations. Nevertheless, the idea that people can “bootstrap” themselves from poverty to wealth – within the current system – is largely unfounded and tragically naïve. Correcting inherent structural inequalities in opportunity, mobility, and justice is the most realistic strategy to address wealth inequality, but is politically possible only if critics win the marketplace of ideas. Publicizing statistics about the economic disbenefits of inequality (e.g., lower tax revenues) is a good start. The new century’s most critical social pathologies – inequality, poverty, and ethnic tension – plague many Asian countries. With the exception of the “four tigers,” Asia has failed to achieve the per capita income levels of the West. China is tapping its budding middle class to support economic growth through domestic consumption, and also recently announced a $2 billion anti-poverty initiative. Nevertheless, the country’s elite continue to build massive stores of wealth, evident from their prominent role as global investors. Echoing arguments in Thomas Piketty’s highly discussed book, some commentators insist that growth in inherited wealth is shutting out economic opportunities for those less fortunate. In a recent speech at South Africa’s Nelson Mandela Foundation offices, Piketty remarked that “creating an annual wealth tax with a very low tax rate will be a way to create more transparency about who owns what.” Even the neoliberal Cato Institute (“dedicated to the principles of … free markets”) argues that policies targeting distributional inequity should focus more on wealth than on income. In countries like Indonesia and Vietnam, the benefits of growth have predictably and disproportionately accrued to those with economic power and influence. The idea that market reforms materially improve the lifestyles of poor farmers relies on the oft-discredited notion of trickle-down economics; the latest wave of growth has clearly eluded such individuals. In a recent commentary, Kristijan Kotarski describes the “financialization” of the Chinese economy as “the rising leverage of financial and non-financial firms and the growing influence of financial elites.” He cites research indicating that as much as 86 percent of increases in inequality can be attributed to housing values. Debt and property are tools of wealth creation available primarily to those who can take investment risks. Hence, pro-wealth policies benefit only a narrow group. 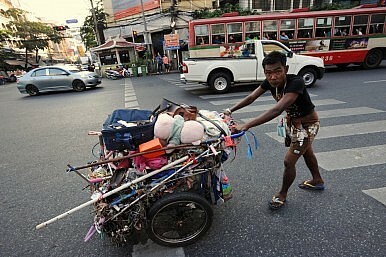 Asia’s economic growth is an impressive accomplishment, but metrics such as global city rankings fail to account for the plight of the economically disenfranchised. According to Credit-Suisse, by 2020 the number of Chinese millionaires will increase by 74 percent, to 2.3 million – still only one tenth of 1 percent of China’s total projected population, but constituting an ever-growing share of the country’s wealth. The surprising fact that inequality has worsened since the 2008 financial crisis is actually no coincidence; the super-wealthy were protected by mitigating policies such as America’s $700 billion bank bailout. The inability to establish a political consensus on the extent of redistribution is a convenient excuse for ideological purists to abandon redistributive policies altogether. Improving conditions for the poor does not require absolute and universal re-distribution. However, there is a line beyond which inequality is too high; 1 percent owning more than the other 99 percent crosses that line. “Who decides how much inequality is unacceptable?” is no longer an excuse for inaction.